112%. That’s a number I made up about how many people suffer from sleep problems. That’s a profoundly high number that, while entirely fabricated, shows definitively that people are simply not getting enough sleep anymore. This is a real problem. Sleep is more than just a place to dream about pink goats and alfalfa sprouts. It’s an activity that is designed to help you create memories, think clearly, and cope with stressful situations. Without sleep, every hormone, enzyme, and blood vessel in your body works less efficiently, and ultimately your health and happiness both suffer. If you aren’t sleeping well, you need to be, because the stress you feel every day you don’t get enough sleep may be slowly but surely damaging your health. 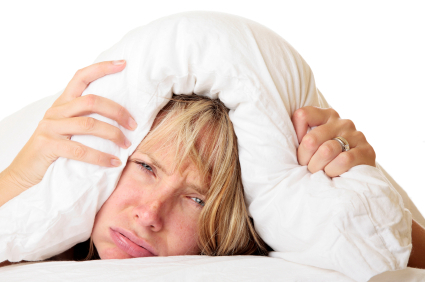 Sleep problems have a myriad of potential causes. The most likely cause is physical laziness. Human beings are smart animals with a great deal of energy, and unfortunately until Apple invents a computer you can use while you jog, we’re probably not getting less physically lazy any time soon. But because we’re not burning off that energy, falling asleep – something that should be natural – becomes much more difficult. It’s not just your body either. Physical exertion tires your mind as well, so those racing and active thoughts that keep you awake may be there because you sit in front of a computer too long looking at Facebook. Sleep issues can also be caused by too much coffee or drinking, too much anxiety, and too much stress that you experience during the day. All of these potential causes make it harder to guarantee any effective sleep treatment, but there are ways you can improve your ability to get a full night’s sleep every night and ultimately live with less stress and more happiness. “Thanks Ryan,” you said to yourself just now. “So you’re saying the solution to going to sleep is that I should go to sleep. Brilliant! Any stocks I should invest in?” But before you go about getting all sarcastic and mean, the reality is that one of the main issues preventing people from getting sleep is that they often ignore it. Your body responds to your behaviors, and if you ignore sleep, your body won’t bother doing it anymore. Here’s a better example. Your body is trained to tell you when you’re full. It’s this natural response that prevents you from overeating, while still ensuring you’ve gotten enough nutrients. Yet there are many people that overeat. Why? Well, some theorists believe that those that overeat may have ignored their body’s “full” response, and eventually their body stopped bothering to tell them when they’re full. So they never feel full, and they keep eating, and ultimately they overeat and become unhealthy or overweight. It’s the same thing with sleep. If you are constantly having nights out where you avoid sleep and ignore your feeling of being tired, you’ll find that your body stops bothering to tell you when you’re tired, and ultimately your ability to go to sleep suffers. Going to sleep earlier (even before you feel tired) and getting a restful night’s sleep can go a long way toward bringing that feeling back. Brilliant advice number two: Exercise. There are very, very few jobs these days that require any form of manual labor, and when they do they’re likely designed in such a way to minimize your exertion. This is bad. All throughout the day your body wants to burn a lot of energy, and yet you sit there at a computer or in an office and do nothing. By the time you go to sleep, that energy is still there, and you’re not tired when you should be. So exercise more. Run around. Get frisky. Do things that make you use your physical energy. If you’re not fond of traditional exercise, then find a way to always be active. At the very least, walk in place when you watch TV. The more you do, the better it is for your ability to fall asleep. Human beings and dogs love routines. They love them. Routines represent comfort, and prepare your mind and body for what’s ahead. It’s why bowlers have their own weird habits and superstitions before they bowl, and baseball players put their bat in the exact same place before they bat. These routines give them the comfort they need to do the next task, and their bodies respond accordingly. You should create your own pre-sleep routine – a routine that is very long, very boring, and involves nothing that would create energy or keep you awake. That means no TV, no cell phone, no bright lights. You may even want to avoid reading or doing anything that involves a mental activity. Try to create a boring routine that takes you awhile and is the very last thing you do before you sleep. For example, start by turning off all of the electronics and lights. Then consider doing other tasks, like checking all of the doors and making sure they’re locked, closing all of the windows, making sure the oven is off – even if you know all of these things to be true, do them anyway, in a specific order. Essentially, this pre-sleep routine will tell your mind and body “Oh, I’m getting ready to sleep” and you’ll have an easier time relaxing and sleeping. You’ll need to do a routine like this for a long, long time for it to work, but it does help many people. The human brain has a lot of strange habits. One of them has a tendency to keep people awake. I don’t think it has a name for it, but it should. We’ll call it “Mind Won’t Shush Up.” It occurs most often when you have stress or anxiety, but sometimes it occurs for no reason at all. What happens is that you have a thought or two in your head that your brain wants to remember. Rather than simply create a memory and let you go to sleep, your brain keeps you awake to help you remember it. Your brain is not very smart. That’s why you need a way to take the thought out of your head, and tell your brain that it can shush up about it. You can do that with a thought journal. Every time you have a thought that you either don’t want to forget or can’t get rid of, take out the journal and write the thought down. It sounds like such a small action, but the truth is that this little difference tells your brain that the memory is in a permanent place, and it doesn’t have to worry about it anymore. There’s no guarantee a new thought won’t enter your brain, but thought journals are a great way to avoid letting a nagging thought keep you from sleeping. Finally, there are only two things you should be worrying about in your room: Sleeping and making ze love. When it comes to being awake, anxious, and struggling to sleep, your location plays a significant role. If you’re constantly working in your room, on your cell phone talking to someone about life events, or fighting with your family, then your room won’t be associated with rest, and your brain will wake up the moment you try to lay down to sleep. If, on the other hand, you only use your room for sleep (and the occasional romance) your brain will associate your room with sleep. Sleeping also begets more sleeping. When you sleep you experience less stress and anxiety, which helps you fall asleep. When you sleep restfully, you get tired at a more reasonable hour and wake up 8 hours later, rather than under-sleeping and oversleeping in a sleepless rhythm. You need to get more sleep. With the above tips, you’ll be well on your way. About the Author: Ryan Rivera had intense anxiety and depression that caused serious sleep issues. He writes about anxiety at www.calmclinic.com. Nice tips for how to get more sleep. I like the idea of keeping your room stress free. Well done. I think a good majority of the population keep a cellphone next to their bed, especially teenagers. And of course as soon as their friend texts them (which could be in the middle of the night) they are up and texting them back. Their body is always on high alert for that next text message so they can never really relax.